The letters are part of The International Cat Association registration (TICA) code, the organization in which Savannahs are registered. They explain how many generations of Savannah matings are in the background of the particular kitten or cat. TICA has three Registries, each of which reflects a different stage in the development of a breed. The Experimental Registry is for unaccepted breeds or for those with unknown background. The Foundation Registry is where most Savannahs are registered at this time. And the Stud Book Registry, where some Savannahs are registered, designates a pure bred cat. Cats in this registry carry the letters “SBT,” the “T” meaning stud book traditional. 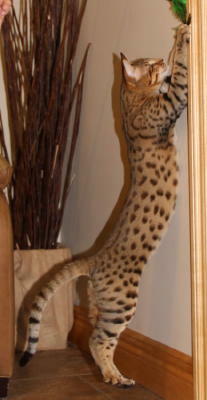 In the case of a Savannah, it indicates studs and queens for the last three generations have been Savannahs in an SBT Savannah kitten’s pedigree. The “A”designation simply means one parent is not a Savannah. 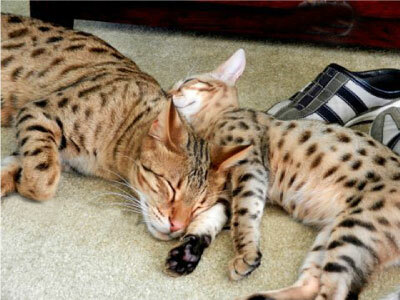 The Savannah breed was created by breeding the Serval to a domestic cat. The kittens from this mating carry an “A” designation, which means they are the progeny of two cats of different breeds. So all F1 (first generation) Savannahs are registered “A.” And since Savannah males are not fertile until the fourth (F4) and fifth (F5) generations, all males bred to Savannah females must be “outcrosses” or non-Savannahs until a fertile male Savannah is born. While the males may be purebred from other breeds, a combination of breeds or a “domestic shorthair,” the kittens resulting from an outcross is an “A.” This means you can also have an F2 A, F3 A, etc. Any mating in which one of the parents is not a Savannah results in an “A” designation. If two “A” registered Savannahs are crossed, “B” registered kittens result. “B” means both parents are Savannahs, but the cat has at least one grandparent of a different breed. Cross two “B” registered Savannahs and you have a “C” registered kitten. “C” tells both parents and grandparents are Savannahs, but at least one great grandparent is of a different breed. When you cross two “C” registered Savannahs, an SBT Savannah kitten results. A kitten with “SBT” in it’s registration number has three generations of Savannah to Savannah matings in it’s pedigree – parents, grandparents, great grandparents. It is impossible to have SBT Savannah kittens before the fourth generation. The SBT designation is what is needed to show in Championship Class. The system can be a bit more complicated, however since the filial (F) generation i.e., the generation removed from the serval, works independently from the A, B, C, and SBT designations. For example, if you breed an F3 A to an F5 C, you will get a F4 B. And if an outcross was used to breed to any generation, those kittens would be “A.” That is, if an F3 C were bred to an outcross, kittens would be F4 A kittens. Letters progress forward from the “lowest” parent’s letter. Numbers do also. So, what does all of this mean when you are looking to purchase a kitten? That depends on why you are purchasing a Savannah kitten. It means little if you are looking for a pet. Our recommendation is to find the kitten that has the look you are seeking. If you want to show your cat, at this time it must be an F3 or further removed generation, i.e., F4, F5, etc., and it must be a “C” or “SBT.” It is the goal of most breeders to get to the SBT level in the F4 and F5 kittens so that the breed can become eligible for Championship status. As of now the breed is at Advanced New Breed status. Once enough SBT Savannah kittens are born and registered the breed will move to Championship status. Once that happens “C” kittens will no longer be allowed to be shown. So if purchasing a kitten for a breeding program keep this in mind.